Among the many gems of Odisha has produced in different fields of art along the centuries, one of the latest is certainly the Odissi dance Guru Sri Kelucharan Mohapatra born on 8th January 1926 at Raghurajpur, Puri. As it is the case with most of the geniuses, who emerge from time to time in the history of humanity, the story of his life is one of struggle and unending dedication. The story of his artistic experience touches all the salient features of the cultural life of Odisha of the last sixty years and it becomes the story of the growth and recognition of the Odissi style as one of the classical dances of India. From the traditional expertise of the "Chitrakaras" through the entertaining art of the "Gotipua" and "Jatra" parties, the "bhakti" oriented "rasa leela" performances and the innovative attempts of the Annapurna Theatre, Guruji's artistic journey is one of continuous learning and growth. Gifted as he was with a highly sensitive, respectful and creative disposition, he observed and absorbed facts and phenomena of life around and transcreated them into forms of aesthetic beauty. The two currents of art present in his family, the traditional painting skill of the Chitrakaras, and the rich and vibrating musical tradition of the percussion players, were happily blended in him. By giving plastic dimension to the first he infuses life into it through the second. The tradition of ' Chitrakaras ' is a cultural heritage that is handed down through images; images that convey ancient legends in a universally understandable medium of communication. But the world of little Kelucharan was not merely populated by visuals, it was also pulsating with the vigorous rhythm of "Sankirtana" and "Jatra" (folk theatre) which used to be regularly performed in his native village Raghurajpur, a small hamlet in Puri district. In the evenings the little Kelucharan could be found in one of the two "Akhadas" in village, watching and imitating the dance movements of the boys under training or trying his hand at reproducing the rhythm of the "Pakhawaj" on his own hips! His father, Chintamani Mohapatra, himself a painter and a "Mrudanga" player, did not encourage his son's interest in the effeminate art of "Gotipua" dance, and to stop the son from going any more to the "Akhadas" of Sri Balabhadra Sahu, he virtually abandoned him with Mohan Sunder Dev Goswami, the founder director of the famous "Kunja Behari Rasa Leela" party in Puri. Here, at the age of nine Kelucharan began to soak up experiences which were going to leave an indelible stamp on his entire life. During the ten years stay with Guru Mohan Goswami he learnt not only acting, mime and singing but also the art of make-up, stage setting and choreography. The working day began early morning with training in singing and rhythm and closed with lessons in the communicative art of "Abhinaya" in the evening. During the day the students, who lived together, also attended to the household chores, like cooking and cleaning, and dedicated themselves to various "Sevas" for the Guru. The troupe used to keep moving on tour, giving performances in villages and towns for about 6 to 7 months a year and the remaining time was utilised in training and rehearsals for the coming season. The shows, an amalgam of song, and histrionics, were woven arround the theme of Krishna-Leela or episodes culled from the Puranas. Mohan Goswami's choreography, with music and stage setting planned entirely by him, was famous in his time. Among the more popular creations of his were "Balyaleela", "Mana Bhanjana", "Sharada Leela", "Radha Premamruta" and "Bidagdha Madhava" built around various poems of Kavisurya Upendra Bhanja, Banamali, Gopal Krushna and Jaydev. 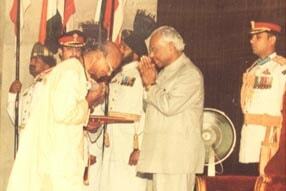 Guru Mohan Goswami played an important role in his life. The Guru was a father and a protector to him. Not only do we find the multi-faceted versatility of Mohan Goswami in Guruji but he too has the same extraordinary spell over his own disciples. For about a year after a leaving the Rasa Leela party he had to battle hard to earn a living. With no fixed source of income he worked as a daily labourer watering and carrying sand for the maintenance of betel groves. This dim struggle for survival eased somewhat when he found a job in Cuttack with the Theatre Company of Mr.Kalicharan Pattnaik for Rs 7/- a month. His job was to help stage setting, act and play percussion instruments. Kelucharan was under the able tutelage of Shri Agadhu Moharana in " Mrudanga " and Shri Kshetramohan Kar in "Tabla" training during his days with the theatre party of Mohan Goswami and he did not stop there. 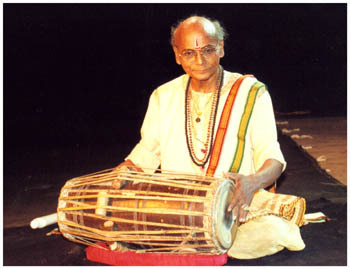 In Cuttack he continued to take lessons in Tabla playing from Shri Harihara Rao.Intially contracted as an accompanist for only a month he stayed with the Annapurna 'B' theatre of Cuttack for about five years from 1946 to 1952 distinguishing himself as a dancer, percussionist and choreographer. The real break came when a solo piece in a dance-drama on "Devi Bhasmasura" brought Kelucharan into the limelight. His brilliant performance as the "Nataraja" under the direction of Guru Pankaj Charan Das, established him as a mature soloist. In the role of Mohini was Laxmipriya who latter became his wife. 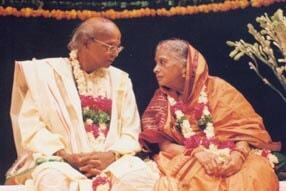 From that day till they married, in all performances either they were partners in a duet dance sequence or Laxmipriya would dance to the rhythm provided by Guruji. Always under the guidance of Guru Pankaj Charan Das and Guru Durlav Chandra Singh (in theatre) the pair became famous for their performances of the " Dashavtaara " dance which was dovetailed into the legendary drama- "Sadhaba Jhia " in 1947. During this period the young Kelucharan also had the benefit of learning from Guru Dayal Sharan of the eminent Uday Shankar troupe, under whose influence he further enriched his expressive vocabulary. The training comprised the use of the various Shastric mudras as well as exercises on physical flexibility and techniques typical of the Uday Shankar ballets. This novel training coupled with his earlier experience, earned him success in his maiden directorial production of the dance-drama "Aloka" with Laxmipriya in the central role. After directing three dance-dramas in mixed technique, when he was around twenty eight, they both left the Annapurna 'B' group, got married and went back to Puri.There he spent a couple of years doing research on both the "Mahari " and "Gotipua" traditions of Odissi dance, imbibing according to his own words, "the spirit of devotion from the first and the technique from the other". The toil of this study found creative expression in his first Odissi composition for the role of Kalavati played by Laxmipriya in the "Upendra Bhanja Nataka" staged by the Annapurna theatres ('A' group) of Puri. All along, he provided brilliant and mellifluous percussion accompaniment, both on Tabla and Mardala, for a number of musical broadcasts by All India Radio Station, Cuttack. 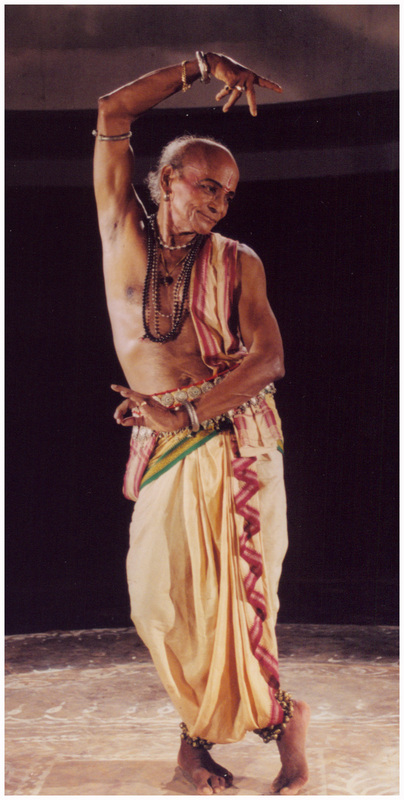 By now Kelucharan was well equipped to teach Odissi dance and in 1953 he joined the Kala Vikas Kendra at Cuttack,the first college of music and dance to include a course on Odissi in its curriculum. He taught there for morethan fifteen years. Besides working in the Kendra he used to impart lessons privately to some disciples including Sanjukta Panigrahi, Minati Mishra and Priyambada Hejmadi and was taking dance classes in some schools and colleges of general education. During these years he choreographed a number of dance-dramas in Odissi style, including "Panchapuspa", "Krushna Gatha", "Geeta Govinda", "Urbashi", "Krushna Leela", "Sakhigopal", "Konark" and "Sri Kshetra". Supported by the Kendra, he did research on various folk & tribal dances of Odisha and enriched his repertory of Odissi dance poses through further study of temple sculptures especially those found on the Bramheswara, Parshurameswara and Konark temples. While involved in this process, his individual style was gradually taking a distinct shape and simultaneously became systematic and precise. These are the years when the first "pallavi" in ragas "Vasanta", "Shankaravarana", "Kalyani", "Mohana", "Saveri" and "Aravi" and the first ashtapadis from Geeta Govinda like "Lalita Lavanga Lata", "Sakhi He", "Dhira Samire", "Yahi Madhava" were composed. 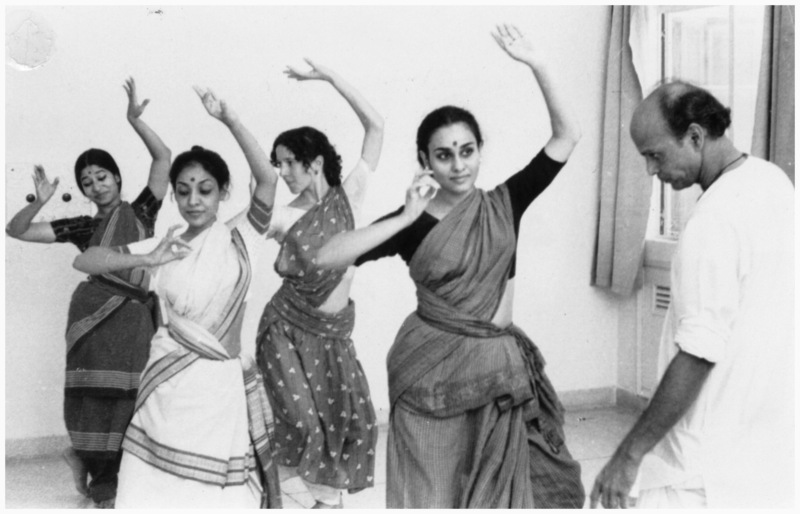 In the eighties, after leaving the Kala Vikas Kendra, Guruji travelled assiduously to different cities of India to be able to teach and spread Odissi dance, as far and wide as possible. He became a regular visiting teacher for the Gandharva Mahavidyalaya in Delhi, For the National Centre for the Performing Arts in Mumbai and for the Padatik Dance Centre in Calcutta.The number of his students kept on multiplying and when he was not teaching them in their respective towns, they would come, especially in the summer months to learn from him in his house in Cuttack. By now Guruji would start to reappear on stage as a solo performer and to leave the audience spellbound by the sensual beauty and naturalness of his interpretations of the character of Radha from the "Geeta Govinda", of the fisherman " Kaibarta " from the "Ramayan" and of "Krushna" from innumerable Oriya songs. Compared with Nijinsky for his " magnificent sinuous torso and arms "and with Chaplin for his" most inspired gestural acting "by American critics, Guruji had by now danced not only in India but all over the world, participating in the festivals of India in London, Russia, Germany, France, America and Japan. His latest compositions in raga Bagesri, Khamaj, Kirwani, are noteworthy for their intricate rhythmic structures which speak eloquently of his choreographic ability as well as his mastery over "Mardala" (Pakhawaj) playing. With his quicksilver wizardry the sound of he "Mardala" was no longer relegated to be a mere support to the dance but came forth as a leading element. For ten long years Guruji was associated with Odissi Research Centre in Bhubaneswar and made invaluable contributions to the work of codification and systematisation of the Odissi style which was the mandate of the institution. After leaving the Centre in 1995, he fully concentrated on developing " Srjan "- the dance academy founded by him and his wife and directed by his son Ratikant. Guruji was a keen hobbyist and one of his favourite pastimes was to play around with brick and mortar and build something almost entirely by himself. As in dance, likewise in this hobby, he was skilled and very focussed. His favourite materials were bricks and cement with which, between one choreography and another, he has built his first house in Cuttack and intended to build there the new Centre for his dance academy. He was infact on a bamboo scaffolding busy plastering a wall of the new portion of his house when the telegraphic message conferring the Central Sangeet Natak Academy Award reached him, in 1966. Unable to decipher the telegram in English, he got a neighbour to read it for him. 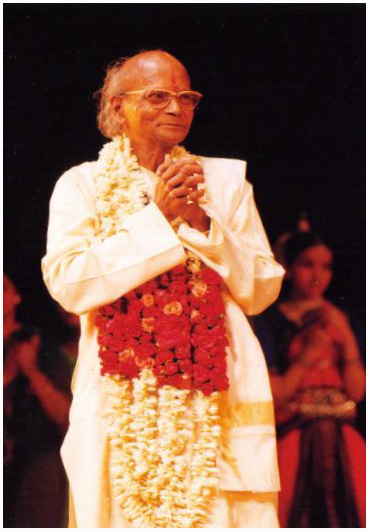 Thus, he came to know that he had become the first Odissi Guru to get this distinction. The distinction conferred on him, also meant recognition extended, at last, to Odissi dance as a classical form. The title of Padma Shree came a few years later in 1975 and in 1981 he was conferred a Doctorate by the Akhil Bharatiya Gandharva Mahavidyalaya.He won the Kalidas Samman awarded by the Madhya Pradesh Government in 1987 and the title of Padma Bhusan in March 1988; the Padmabibhushan was conferred on him by the President of India in March 2000 and Shankerdev Award of Govt.of Assam by the Prime Minister of India in March 2001. In spite of the many honours received, the amount of work produced (he has over two hundreds solo compositions and about fifty dance ballets to his credit) and the number of students who hail from all over the world and literally adore him, Guruji has never lost his undemanding simplicity and childlike purity: he lets his greatness sit lightly on his shoulders, carries his genius playfully with him. For him dance is "Sadhana" and teaching is "Dharm". He says "Hundreds of my students are dancing today and I feel as if I am dancing in all their beings. Only when nobody can take my dance or my art further will I experience sadness". 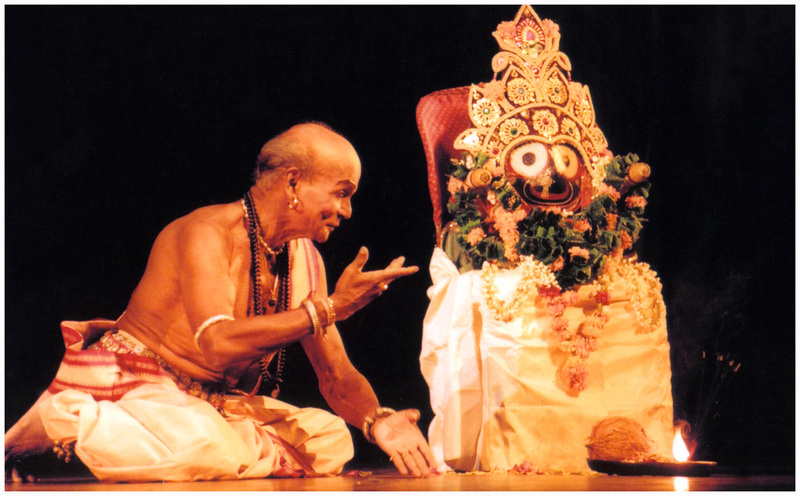 Devotion and dedication run through the life and art of Guru Kelucharan Mohapatra. Each action in his life as in dance, is a continuous offering at the lotus feet of Lord Jagannath. Odissi dance in the hands of this great master has climbed to new and dizzy heights, and has become an universally admired Art form through which this great soul has, humbly and sincerely paid his devoted service to divinity.